It’s been a few months since I’ve updated you on our big house renovation so I thought I’d take some time to sit down and tell you where we’re at. “Renovation” might not be the appropriate word to use. “Rebuilding” is probably more accurate as we’ve taken the entire home down to the studs, and are adding an estimated 600 square feet to the footprint. By the end of this project we’ll for all intents and purposes have a mostly brand new home. 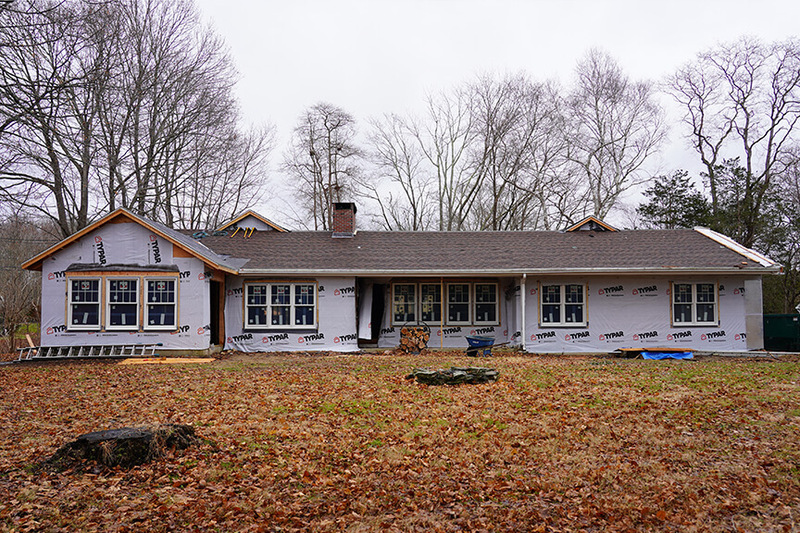 If you’re not familiar with the project, you might want to take a moment to read this post, which talks about the special significance of the ranch house we purchased, as well as this post, which is my first update about the project. 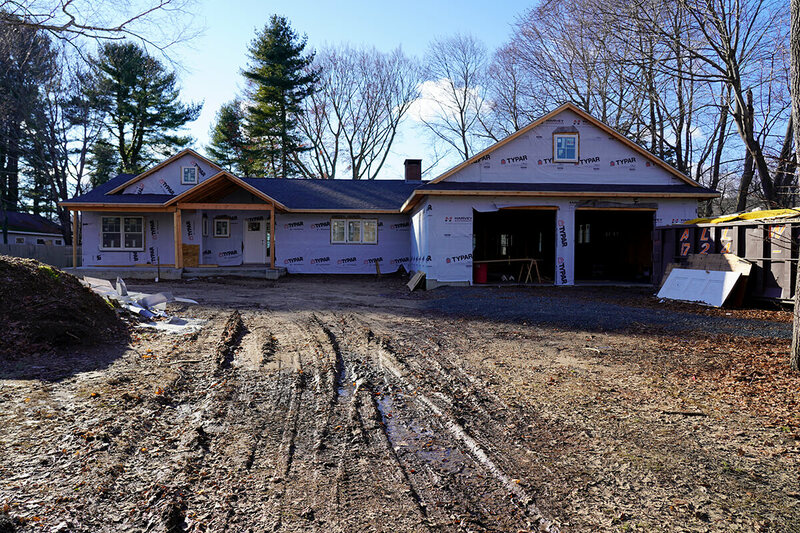 Our contractor officially began work in September and the new exterior of our home is finally taking shape. So far two additions have been constructed. One is a massive two-car garage (with the old garage becoming livable space). The second addition involved turning a sunroom into a year-round structure that will serve as our master suite … and “sweet” it is as we have a big walk-in closet and huge bathroom complete with a stand-up shower, double vanity and soaker tub (which is going to make this mama-to-be very happy). Our architect did a really nice job of transforming the existing home into an open concept that utilizes the space to its fullest capacity. 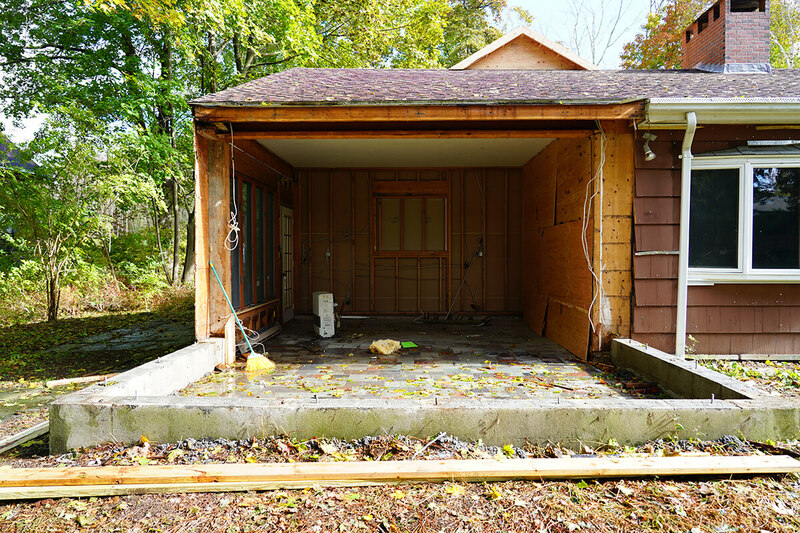 So while the old sunroom will soon be our master bedroom, so will part of our old garage. 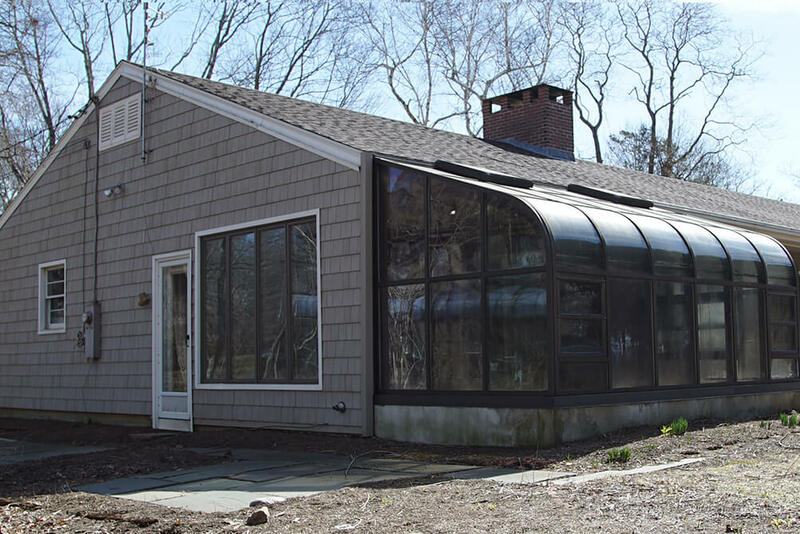 Another big thing that was constructed is a large front porch, which has a double gable overhead. So what was once a ranch house with a very straight roofline now has a craftsman feel, which I LOVE. It’s truly unbelievable to see the before and after shots, even if the exterior isn’t fully complete yet. 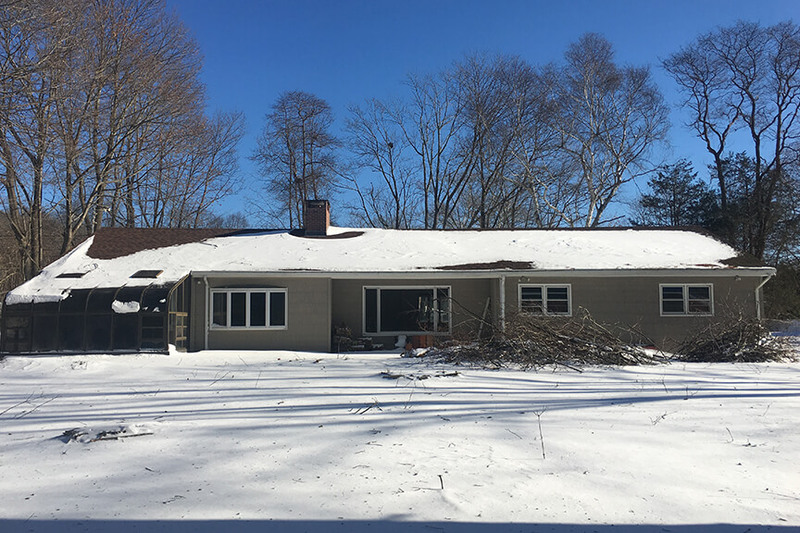 A new Certainteed roof has been put on featuring dark gray shingles (the color is called “pewterwood”), and our new windows and doors have also been installed, which has really helped the home take on a whole new look and feel. Before, many of the windows were short and high and located alongside various picture windows. Now the windows are larger and cohesive with a six-over-one grid. The back of the home now has a gable over our master bedroom and looks so good with the new windows and doors, it could almost serve as the front of the house. For the front door, we opted for a craftsman style, which we plan to paint a light greenish blue. Our garage doors (soon-to-be-installed) also have a craftsman look. The exterior of the house is going to be a combination of vinyl Cedar Impressions and Monogram siding, both from Certainteed. We opted for the color ‘Herringbone’ which is a light neutral color. The cedar shingles are the 5″ Triple Saw Mill Straight Edge, so they’ll have a smaller, smoother look. Initially, we were planning on doing the entire house in Cedar Impressions, but to keep costs down, we opted for the combo look. We were at first thinking about pairing board and batten with cedar impressions, but since they come in such long panels, we would have ended up paying about $1,000 in wasted product. So instead, we choose traditional siding. Nowadays, it’s not uncommon to see houses with a mix of one or more of the following: cedar shakes, siding, board and batten, and stone. I personally like this look as it gives a house a bit more dimension and visual appeal. The entire front of our home will be cedar impressions, but the sides and back will be siding. However, I wanted to ensure the two different styles tied in together. So not only will they be the same color, but all of our gables on the sides and back will be cedar impressions, along with an inset on the back where a small porch is. 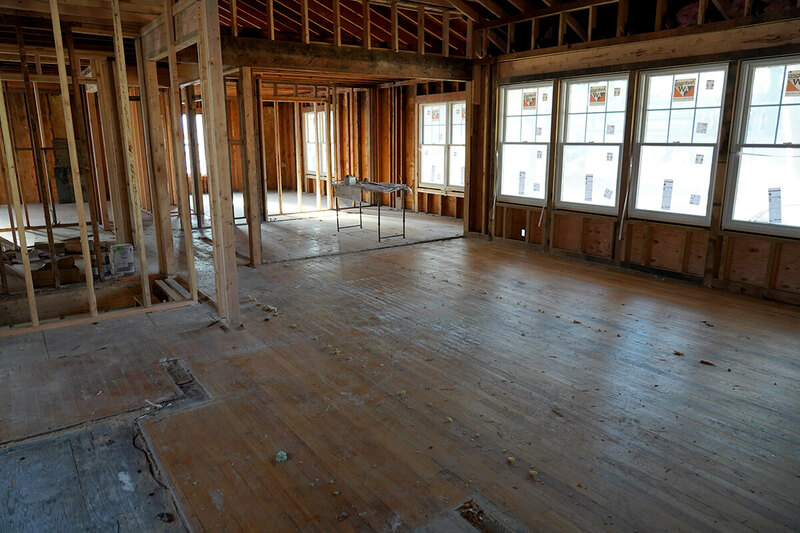 The interior of our home still looks like a construction zone, but it has been reframed to the new layout. The transformation is amazing. Our kitchen opens to our living room which opens to our dining room (which was once a bedroom) and entryway. Our basement stairs were also moved to lend to the open floor plan. They once separated the kitchen from the living room, but now they’re tucked between the side of the kitchen and entryway. At the top of the basement stairs, we’re putting a french pocket door, so it won’t feel like you’re going underground, but rather to a different part of the house. 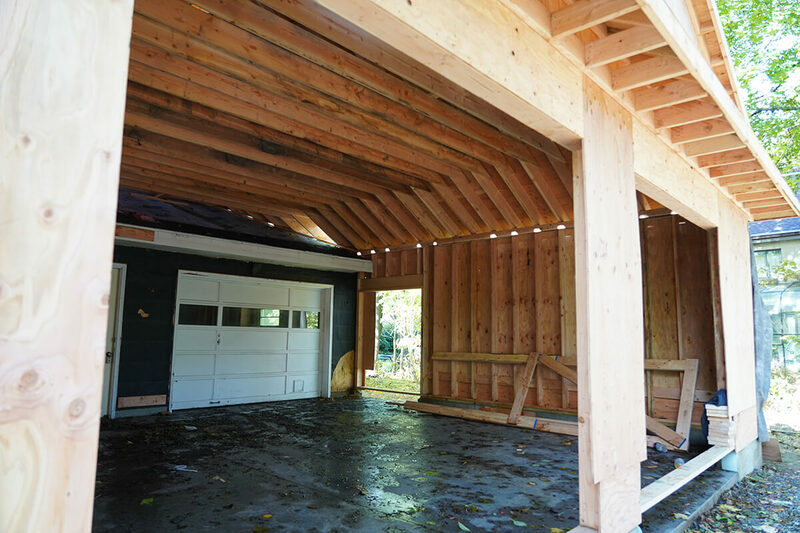 A shot of the new two-car garage showing where the old single garage door was. We’re not finishing the basement during this go-round but plan to do it in the future. 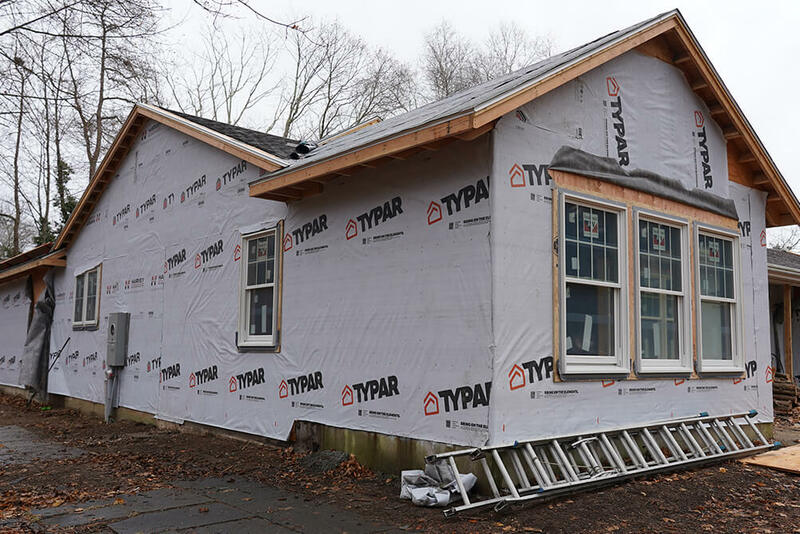 With the framing in place, you can also see where our new powder room, mud room, and laundry room will be, which are all located right off the new garage and kitchen. The space those three rooms are in is actually all part of the old garage. Our kitchen also features a big walk-in pantry which was once the eat-in area of the old kitchen. What was once a second living room (why did our grandparents have so many areas to sit? lol) will soon be our office/playroom. The old sunroom after it was tore down in preparation for the new framing. 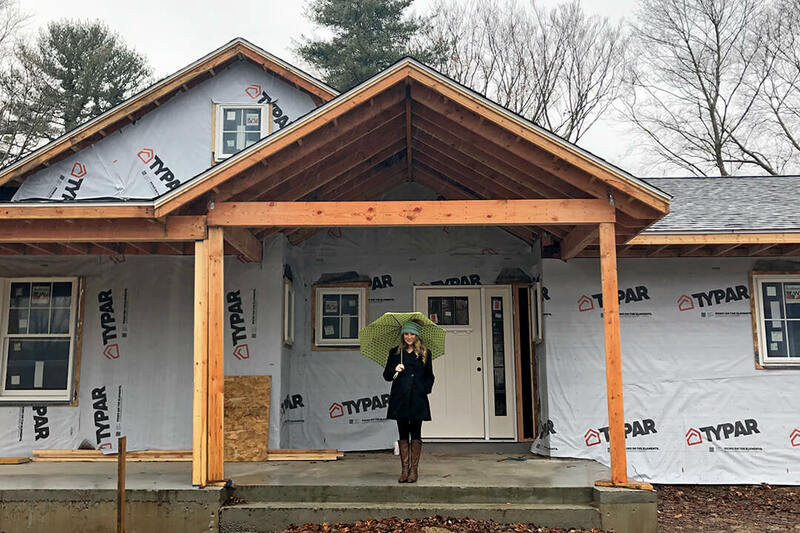 For me, one of the most stressful but fun things about building a house is making design decisions, however, I would say things have gone much more smoothly than anticipated. We seem to know what we want with perhaps a little back-and-forth decision making. One thing we did go back-and-forth on are our kitchen cabinets. At first, I was leaning towards a more traditional raised panel cabinet door with shaker throughout the rest of the house, but then I realized shaker would provide a more up-to-date look. We also met with our cabinet company to pick out cabinets for our laundry room, master bath, kids’ bathroom, dining room and playroom/office. Remember how I said I loved how our architect made great use of existing space? Well, what’s really cool about the playroom/office built-in is part of it is going inside an old closet. Who’d a thunk? The view from the kitchen of the living room and dining room. You can also see a couple of the bedrooms, bathroom and new placement of the basement stairs. While most of our cabinets will be white, we’ve opted to go a bit different in our laundry room and kids’ bathroom. The laundry room will feature light sea foam blueish cabinets while the kids’ bath will feature a light brown “driftwood” colored vanity, both from the company Eudora. We picked out our plumbing fixtures and opted for all chrome. Let me just say this: plumbing fixtures (just like everything else) are expensive. Hoping to go with oil rubbed bronze? That’s going to cost you. A lot. We like the look of chrome and it’s the most cost-friendly. Plus, we decided to stay consistent throughout the home. We do plan on having oil rubbed bronze lighting fixtures and door knobs so we are mixing finishes a bit. A view from the living room of the fireplace with kitchen to the right. 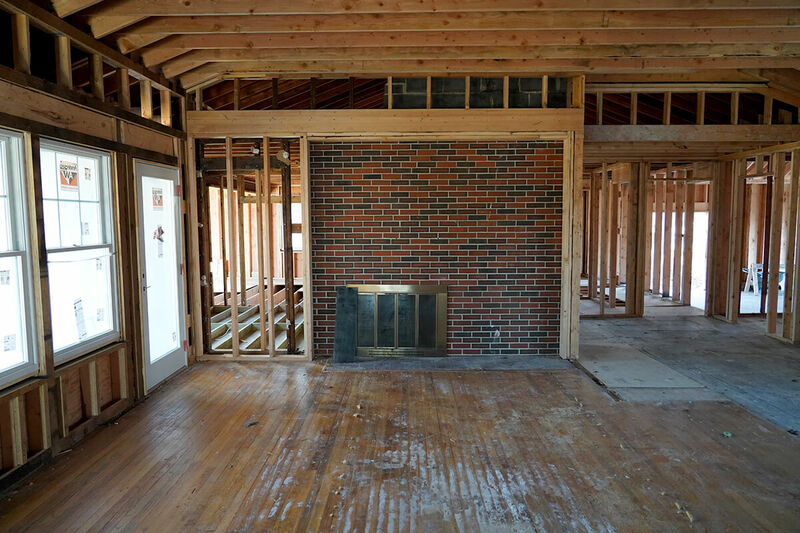 The brick will be painted white and we’re getting a gas fireplace insert. We purchased a good deal of lighting from Wayfair during their Black Friday sale, but we do have a few more fixtures to get. We also still have to pick out stone for the bottom of our front porch, tile and fireplace inserts. And if you’re wondering, ‘How are you living there with all this construction going on?’ we’re not. 🙂 We’re still living in a condo a bit away from our new home, but we head down there about once a week to check on the progress. 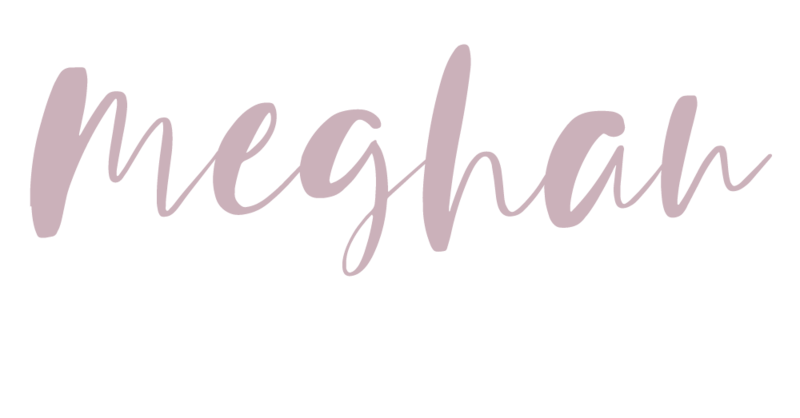 With a baby on the way, it would have been too much to sell our condo and live with either of our families, especially since this process is taking longer than expected. So instead, we opted to stay put until the time is ready.